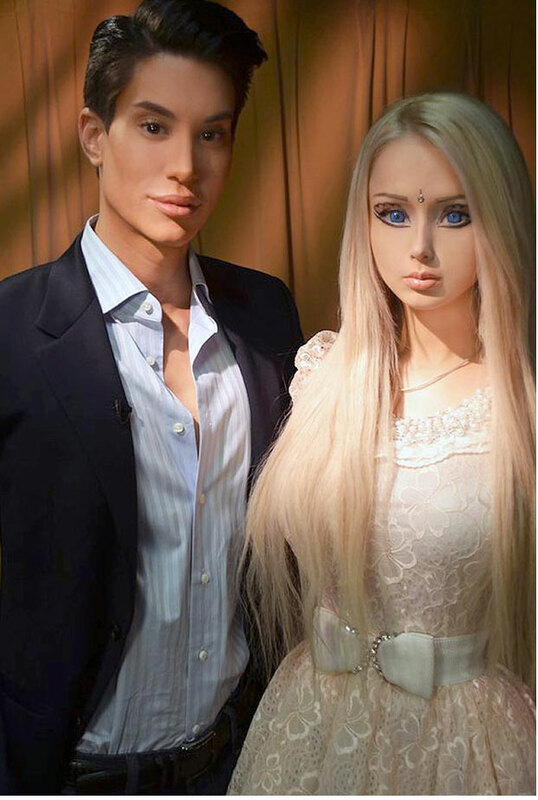 YOU might have thought when Justin Jedlica first laid eyes on real life Barbie girl Valeria Lykyanova it would have been a match made in doll heaven. But instead, it was a match made in plastic surgery hell. 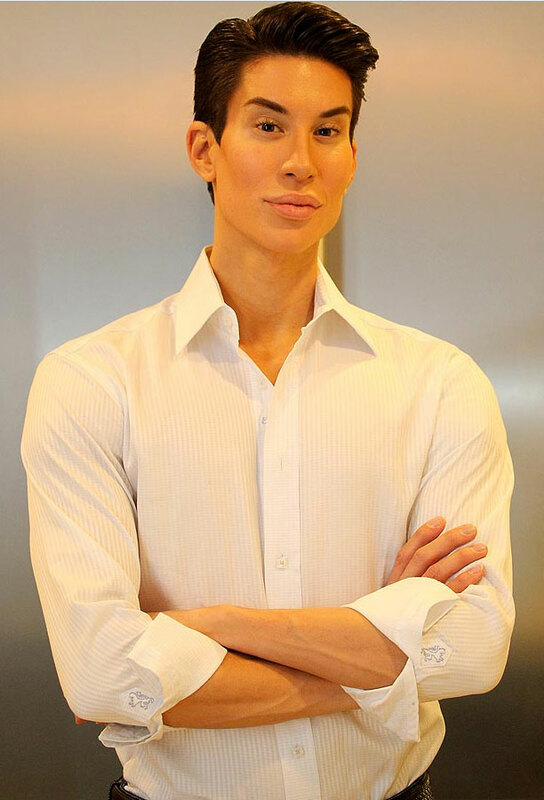 Justin, who has spent over $100,000 to look like a human Ken, has revealed his female counterpart is 100 percent fake. After meeting Valeria, 23, for the fist time last week, Justin admits that she is an ‘illusion and a fake Barbie’. Justin said: “Her hair is fake, her lips are drawn on and she insists on having tons of extra lighting in the room to make her skin look porcelain white. “But in reality, when you wipe away all that make-up you just have an average-looking girl next door. He said: “I was very tall and thin and a bit awkward as a teenager and was always a bit of a loner. “I had gaps in my teeth, I wore huge bifocal glasses because my vision was so bad and I was forced to shave twice a day because I had so much facial hair. Flipping through fashion magazines and tearing out pictures of exotic looking models, Justin created his own idea of beauty by piecing together the perfect body parts. Justin would even draw eyeliner on his face and use make-up to create shadows as a mock up of what he wanted to look like. He said: “When I was 14 I started drawing pictures of what I wished I looked like with a thin pointy nose, flat forehead and blue eyes. “I would even photo copy pictures of myself, alter them with pencils and erasers to make myself look more attractive. 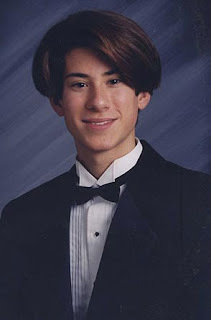 Unlike most kids Justin’s age, who had posters of pop stars hanging on their bedroom walls, Justin’s room was plastered with pictures of models like Gisele Bundchen. While his mother has been supportive of his decision to have surgery, Justin’s dad William, however, didn’t understand his son’s obsession, something which Justin reveals still causes tension today. Finally, when Justin turned 18, the legal age in the US to have surgery without needing parental consent, he consulted a plastic surgeon in his hometown of Cary, North Carolina for a rhinoplasty. It was the same plastic surgeon his mother Tanya had used the year before for a breast augmentation and seeing the success of her operation was the reassurance Justin needed to go under the knife. 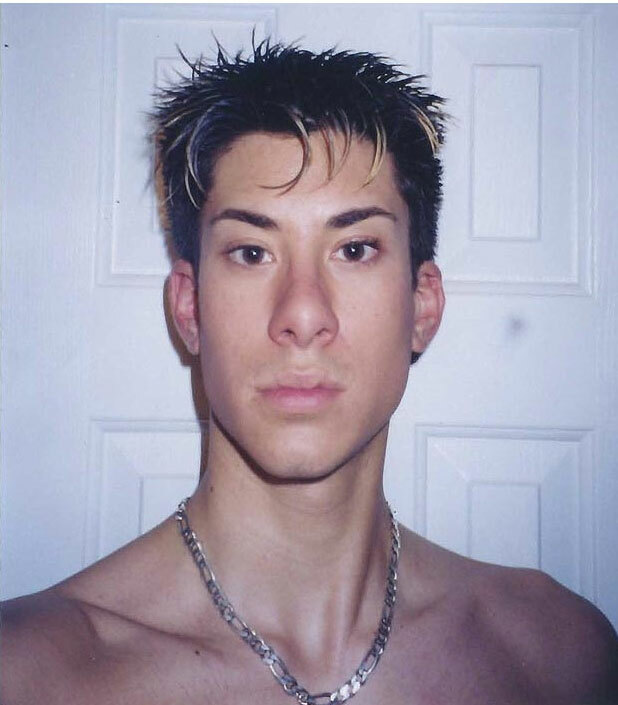 In 1998 Justin took the plunge had his first nose job, using $4000 his mother had collected and saved over the years for him from birthday and Christmas gifts. 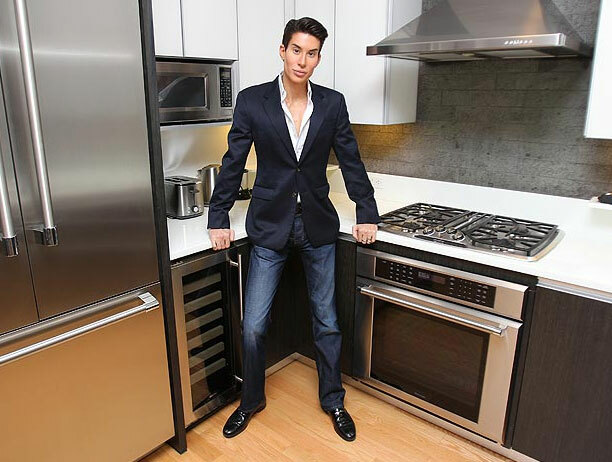 Justin was so inspired by his surgeon’s work he went on to have his vision corrected four years later and spent $4000 on PRK laser eye surgery in 2002. He also splurged $2,500 on teeth bonding and bleaching and his obsession for perfection has continued to escalate ever since. Justin said: “I was hooked the first time I went under the knife and seeing the results just gave me an amazing buzz I knew I wanted to experience again and again. “Fixing my nose was my main objective when I first started getting plastic surgery, but as I continued to learn about new treatment options I kept wanting more and more work done. It really is an addiction. In addition to five nose revisions, Justin has spent $4000 on cheek and chin fillers, $3,000 on lip injections and $6000 on a cranial brown lift – spending over $60,000 on his face alone. But Justin’s maintenance routine doesn’t stop there. For in attempt to reverse the effects of aging, he’s spent more than $15,000 on skin rejuvenation, chemical peels and full body laser hair removal. When it comes to Justin’s implants, however, bigger is better. 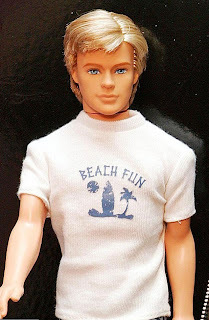 And an effort to emulate his idol Ken, Justin has spent a fortune building up his muscles. In 2006 Justin had pectoral implants put into his chest for $7000 and three years later spent $13,000 on bicep and tricep implants. He’s also had 13 rounds of fillers to plump up his gluteal region. And most recently he spent $16,000 last December on a groundbreaking three-part shoulder implant surgery. “My mum used to be a personal trainer so I would spend hours working out, but I haven’t been to the gym in two years now as for me surgery gives much better results, which are permanent. Incredibly, Justin has never had any health scares under the knife and has nearly 30 plastic surgeon contacts on speed dial across the nation. In fact, he’s even catapulted his plastic surgery obsession into a career as a plastic surgery consultant. And according to Justin, he isn’t ready to give up his addiction to pain any time soon. In fact, he has a long list of dream surgeries including quad and calf implants, abdominal implants as well as a surgery to permanently change the colour of his eyes which will likely set him back another $50,000 in total. Fortunately for Justin, however, money isn’t an issue. “Thankfully I have great friends who support me personally and a partner who helps support my surgeries financially. “But of course with every procedure I’m accepting a certain amount of risk, especially when I’m put under anesthesia. “I realise I could die on an operating table and that something could go terribly wrong, but I don’t let that fear get in the way of pursuing my dreams. Justin added: “I love the fact that I’ve had 100 different cosmetic procedures as it’s helped set me apart as a unique individual. “Some people might say I look overdone, but really I’m just trying to look like an improved version of myself. As pointed out in one of Concannon Plastic Surgery’s prior blog posts, “The quest to look like somebody (or something) else is never going to be healthy.” The point and spirit of plastic surgery is for each person should be the best version of themselves, not be another version of somebody else. Each person has unique talents, abilities and appearance — you should maximize that instead of hunting down a desire to look like (Angelina Jolie). Someone who seeks out an extreme amount of surgery is a red flag for mental health issues, such as body dysmorphic disorder. The purpose of plastic surgery is to make people feel comfortable with who they are and copying a person’s appearance “runs counter to what aesthetic surgery stands for.